Dotworkz wants to make solar-powered surveillance easy. 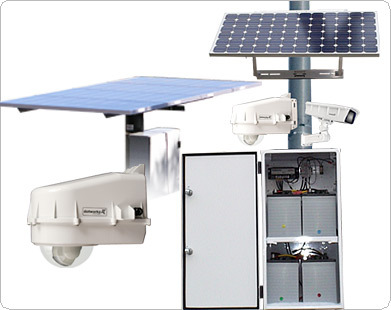 In what can be a daunting design challenge for even experienced integrators, Dotworkz recently announced two types of solar kits specifically designed for video surveillance applications. Do these kits deliver, or is this announcement more flash than substance? In this note, we break this offering down. While the image shows a full system, items NOT included in the kit include the pole, camera, camera housing, conduit, network switchgear, and NVR/wireless radio equipment. Intensity of Sunlight (at install location): This variable affect panel sizing. Average days of Sunlight: This variable affects battery sizing. Make, Model, and Quantity of Equipment to be Powered: Dotworkz calculates the power budget required by the cameras, switches, housings, and radios to be hung on site. Intended Mount Surface: Dotworkz determines if mounting location (pole, structure, etc) is suitable and sturdy to support required equipment. As we noted in our Solar Surveillance Guide, successful designs must consider multiple environmental factors. Ultimately, we believe the individual design approach Dotworkz takes for every request is essentially necessary given how site conditions vary. Absorbed Glass Mat (AGM) Batteries: This battery type is designed to mitigate the risk of swelling in hot weather and does not need maintenance once sealed. AGM batteries are 'deep cycle' batteries, designed to be constantly drained and recharge more quickly compared to other battery types. The batteries included in the kit have a typical service life of 3 to 5 years before replacement is needed. Dotworkz specifies number of batteries based on demand, and typically calculates 3 - 5 'dark days' of capacity per bank, meaning cameras can remain operational for that time without battery recharge. Central Charge Controller: This device regulates the charge/discharge of the batteries, and monitors available power capacity. Because of the battery types used, discharging the batteries too deeply can damage them. The controller automatically shuts down the equipment to prevent this damage, and automatically boots up all equipment when sufficient charge is built back up. Monitored Lightning/ Surge Protection: The integrated surge protector includes a relay output when triggered, notifying a dangerous condition. This arrester is designed to protect the batteries from a surge condition, but does not replace arresters needed to protect camera equipment. While proper grounding includes driving a rod into the earth, this is not furnished in the kit. Optional Polling Unit: While not part of the 'basic' kit, an SMTP module can be included at the factory so that remote health monitoring of the unit is possible. Inputs monitoring voltage and battery condition is the standard module configuration, but it can be configured for other devices (cameras, onboard NVRs, switches) if specified. Even though Dotworkz advertises this kit to match up with it's line of housings: the Dotworkz S series, and D2/D3 line, the solar kit can be used for any combination of camera and housing. The final configuration of chosen equipment needs to be established before Dotworkz specifies the final kit 'bill of materials', but they have not limited it to specific products or manufacturers. Because each kit is subject to specific design, there is no fixed pricing available. However, the manufacturer suggests that the price range for most deployments will fall between $3500 to $6500, and the average 'kit' costs $5000. Dotworks claims free lifetime technical support on the kit, and offers for-fee installation services. Even when installers prior experience, Dotworkz builds the kit to install with pre-terminated cables featuring 'tool-less' connectors. The kits are designed to be installed on poles or walls by low-voltage surveillance technicians. MicroPower: Compared to 'open design' of Dotworkz kit, MicroPower has limited camera options, and limited features. It is an all in one solution, including wireless link that despite its limitations is likely quite simple to deploy. See our updated 2013 review. Sloan Security: This is a fairly unique solution with solar cells wrapped around the pole, rather than using unsightly panels, but has relatively low power output and limited camera/equipment integration as a result. Pricing is high, at ~$10,000 per pole. Solis Energy: This provider specializes in solar energy components, but requires a certain aptitude and level of experience when selecting components. While the company offers free design services for power elements, they claim no specific knowledge of video equipment. Pricing for components equivalent to the Dotworkz kit will range close to the same, between $2500 and $6000 for most applications. While the features and price range of these options vary, the approach Dotworkz has taken does not represent a significant technology improvement compared to competitor offerings. However, in the same way that products like Razberi's NVR simplify design and installation for head end servers, Dotworkz is wagering that it's 'Solar Breeze' kits make purchasing 'solar' easy for non experienced designers and integrators.